93 million people will travel over the next two weeks according to AAA, and if you’re one of them, you’ll want to download some of our suggested travel apps to help you navigate your way during the busiest travel time of the year. If you’re one of the millions taking to the skies, you’ll want to have the newly released TravelNerd on your smart phone or tablet. TravelNerd’s Airport Guide looks to simply things by providing everything from terminal maps, flight status information (delays/cancellations). If you’re stuck at the airport or just have time to kill, there's also restaurant, shopping and lounge locations and hours, not to mention WiFi pricing and availability. 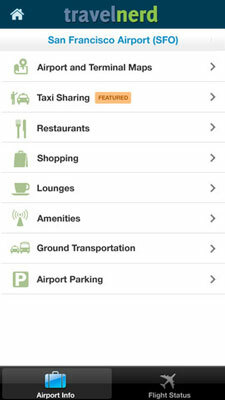 If you’re finally reached your destination and don’t have someone picking you up at the airport, you can use TravelNerd’s cab sharing feature to save you some time and money.